Mormon parents use leadership skills to raise their families. As a young mother I learn each day that I must be able to lead myself before I can lead children. This implies knowing where I want to go and to organize myself to reach personal goals. In a family you will be required to organize the children to follow your example. This applies to such things as cleaning the house, making meals, planning vacations, spending and saving money, cleaning, playing games, and in any and all of life’s activities including spirituality. Your skill and development is these activities provides a foundation for spiritual learning. Early in life you could follow others, but now you have children that must follow you. This requires a form of self-direction that will be necessary when you must deliberately choose the spiritual path instead of an easier alternative. The usual foundation for establishing a solid spirituality is values and self-control. Being a leader cannot be accomplished without illustrating and discussing values and morals. Most things in life, especially the life of children and teenagers, center on moral issues more than they do in the everyday world of adults. Parent leadership will require leadership in how to make choices about right and wrong, good and bad, kindness and unkindness and so forth. In the following large family, the moral foundation was in place. I was raised in California, in a family of six, four children. My parents were great examples for how a person should live. I cannot say that I always followed their direction during my youth but I always knew it was how I wanted to live when I was older. I never heard them use a swear word. We never had an R-rated movie in our home. We always went to church. We were involved in every church activity. And Sunday was a day of rest and Monday was a day for family night. In studies of teenagers who turned out well despite living in neighborhoods known to produce problem children and crime, it was the mother’s presence that made the difference. Fathers were also shown to be critical, especially for boys. Good parenting can’t be done with quality time alone. There must be quantity. The most important step is to be visible and participating in the life of the child. Be aware of their school assignments, know the classes children are taking, the friends they associate with, the problems and difficulties they encounter. My mom always took the time to ask me how my day went, and tried to get information out of me about my classes and teachers and friends. When I was a child, I was eager to tell her and talk. But as a teenager, I didn’t want to tell her much – it was my personal business. But as time went on I really admired my mom because of her spiritual inclination and strengths. She always used an example from the scriptures or apostles when talking with me about my problems and she always lived her life in a very admirable way. Her spiritual consistency really helped me during those tough adolescent times as well as now, when a good role model is needed. She took time whether I was responsive or not. Leaders need what they call in popular vernacular, ‘a presence’. You need to be there and also be salient. All such things refer to the importance of you in the life of your child. This is particularly true with the older child or the adolescent. Sometimes we think because older children can do so much without parents that they don’t need parents. The contrary is true. Older children actually need more time. My mother has great faith in her children. She is always encouraging us to do our best, and our best is good enough for her – even if we fail. She has taught me to rely upon the Lord for strength – especially spiritual strength. A few weeks ago, I was having a really difficult time with school, work, and handful of other situations. I thought I was at the end of my rope. However, my mom helped show me that she knew I would be okay. She told me she would pray for me, and has other family members pray for me also. She then got up really early the next day and wrote me and email with the subject of “I hope you feel the spirit all day.” Without my mother’s belief that I could be led by the spirit, I bet my day would have turned out completely different. I was blessed in countless ways that day and I did feel the spirit. Before a parent can lead, the parent must be a good listener. Listening can be active or passive. Listen to more than words and receive information from body language, actions, and facial expressions. Listening is important for two reasons: 1. the child needs to talk with someone, and 2. the parent comes to understand the child. In most cases the child will be able to solve his/her problems if the parents begin by listening. Sometimes, as in the following example, listening is all that is necessary, and so it is here identified as more important than other forms of communication. My husband and I are not yet parents, but I know what a great parent he will be because of the help he offers me spiritually. He has a wonderful ability to communicate with me through listening without ever judging or criticizing me. He is able to look at my face and my actions and know when there is something on my mind even before I have said anything. I am not one that likes to sit down and talk about my feelings, I would much rather like to keep them to myself and figure things out on my own, but my husband makes me sit down with him and tell him what I’m feeling. After he has listened to me, he will think about what I have said and then will start asking me questions about my feelings which really helps me to look deeper inside myself and to understand my feelings and myself better. He is the best listener I have ever known. Our kids will be so lucky to have him as their father. The discipline can also take many different forms ranging from sharing feelings, a scolding, withdrawal of privileges, use of natural and logical consequences, [and other] appropriate and reasonable forms of punishment. If the parent delivers reasonable discipline, the child will become self-disciplining which is essential in being spiritual. Discipline is necessary and cannot be side stepped or avoided, but almost any form of discipline works better if the parent is first kind and loving. A child who is afraid of his earthly father is less apt to reach out and feel secure with a heavenly father. My brother and his wife have a plaque in their home with the simple inscription “A family that plays together stays together.” Across the room is another plaque saying “Pray”. Both play and pray are vital. 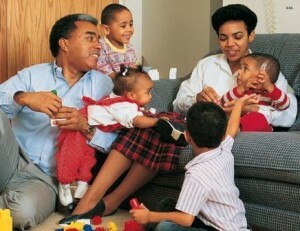 In many families special time set aside for play. It is important to include fun with the spiritual. As a child, my parents would occasionally take us out on dates with them. They have seven children – six boys and me – the only girl. They thought it important for us to feel like we were all individually important. I have never felt their involvement more strongly than when we participated in this “date night. Children need love, but sometimes they also need involvement. I am the seventh of nine kids and I grew up in Missouri. My parents always spent individual time with us to make us feel loved. My mom was especially good at making sure we knew that all restrictions were because she loved us. On the weekends my parents wanted us kids to tell them all the details of my plans. I thought this was a pain and pointless, but I came to understand how concerned my parents were. I think telling them my weekend plans also helped me to stay out of trouble. My parents knew who I was with and where we were. If I thought that they wouldn’t want me doing something I could use my parents as an excuse not to do it. The extra love and concern my parents showed helped me stay out of trouble. Growing up in Southern California where life is fast-paced and hectic, I always wanted to be on the go. My dad was also very busy and interaction between us was often brief. I remember one time I had a big concern about a guy I was dating, so I went to my mom to talk about it. She said I should get my dad’s advice, but I wasn’t as confident in bearing my soul to my dad. Finally I did. I was amazed at how he just sat and listened, making only brief suggestions. I was able to talk myself through the problem, and my ability to confide in my dad grew. Since then, it is much easier for me to talk to him because I know he’ll listen without judging or lecturing. He also showed me that he was willing to take time out of his busy life for me. Once you become a trusted listener who keeps confidential the personal private disclosures, you will find that you will be hearing more of the child’s heart, soul and spirit. At any age this takes place gradually and if done with sincere love and respect you will come to know the spirit of the person. Only after this has been done can you move on to being the spiritual teacher you are meant to be. And when do we stop being a parent? Maybe the answer is never. A teacher too often is thought of as a giver, a teller of information. Yes, this is one aspect of teaching, but teaching involves much more. As mentioned before, a good teacher/parent begins by listening. This moves to understanding and trust. When you have understanding and trust you are in a fine position to begin giving information. When you have love, understanding, and trust the next natural step in teaching is sharing. Share your knowledge, insights, appreciations, feelings, values, and many other spiritual parts of yourself. This is a genuine giving of yourself to your child. When this happens you will teach whether you know it or not. Now if you can share your personal experiences with the more common parts of life, you have opened the door to sharing spiritually. Whenever there are two or more people, such as in a family, there will be problems. In life problems are impossible to avoid. Because family members differ in their needs, values, goals, they will have problems. The key to a successful family life is not in eliminating problems but learning how to solve them. For almost all problems, the same solution process is called for. It requires: (1) identifying the problem, (2) searching for possible solutions, (3) discussing which solution is most appealing, (4) implementing the solution (5) and if it fails go back to step one. Parents often follow these steps naturally as they solve problems with their spouse and the children notice. At other times it is necessary to bring everybody together and sooth hurt feelings and reduce anger before beginning a more formal problem solving process. Problem solving is one of the most important skills that can be taught by example and also by well-planned practice using the problems offered up in daily living. A child who can solve problems in the home will be more likely to solve problems in their educational, social, and even spiritual interactions.